Connecting for Kids - Be a S.T.A.R. Teach Your Child How to Be A Parking Lot Safety S.T.A.R. STOP: As soon you get out of the car, stop and stand still. 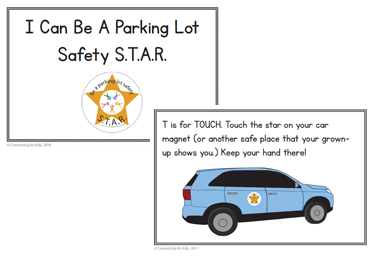 TOUCH: Touch the star on your car magnet (or another safe place that your grown-up shows you). Keep your hand there! ATTENTION: Pay attention and look at the cars around you. Listen to your grown-up. READY: Wait for your grown-up to tell you it's time to go. Then take his or her hand and go. 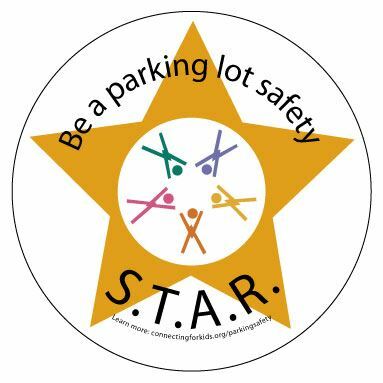 Helping your child learn to be a Parking Lot Safety S.T.A.R. is easy with this free social story that you can download and print. Simply download the file, cut along the dotted lines, and staple the pages together. Role Play: Practice the S.T.A.R. method in a safe place (yard or living room). Guided Play: Act out parking lot safety situations with toy cars and dolls. Remember to ask your children questions such as, "Who can the doll ask if she is not sure it's safe to walk away from the car?" or "What should this person do when they get out of the car?" Prepare Ahead of Time: Talk to your child about parking lots before leaving the house and reinforce what your child can do to stay safe to help them to prepare for the actual experience. This article from Military Wife and Mom gives some suggestions on how to do that. "Wow! I saw you touch your magnet right away, Tommy. Great job thinking about parking lot safety!" "You're being very patient while I get your baby brother out of the car, Marissa. Thank you for thinking about your parking lot safety rules." "You remembered to hold my hand all by yourself, David. I'm proud of you!" 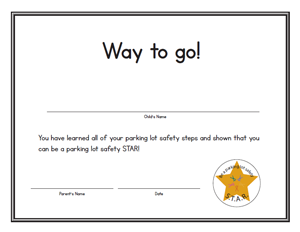 We have also created a certificate that you can download and present to your child once he or she demonstrates knowledge of their parking lot safety steps. S.T.A.R. magnets and safety kits are available to Northeast Ohio families at no charge when you complete the application form. 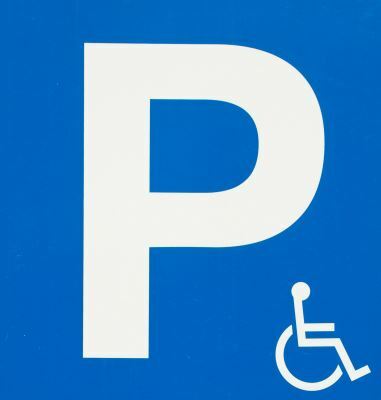 Children with cognitive and neurological disabilities may be eligible to receive a handicap parking permit, allowing their caregivers to park closer building entrances and reducing the amount of time they spend in parking lots. To receive a disability placard in the state of Ohio, you must complete the application and get a prescription from your child's doctor. For more information, see the Department of Motor Vehicles web page for Ohio or contact your child's pediatrician.